Last month we had the pleasure of getting a visit from KFitzEats (@kfitzeats on Instagram). She was on a quest to find the best savory crêpes in Miami. As a proud French Bakery, we do love our crêpes. We think crêpes are very underrated in the US and we thought this would be a great occasion to shine some light on this delicious option. You will find a mountain of options for both savory and sweet crêpes. And crêpes are often consumed with cider that is drank out of a little bowl not a regular glass in crêperies (might sound strange but you don’t mess with tradition). That being said, people also make crêpes at home and it can make for a very fun themed party with family or friends. In these cases what is usually being done is all sorts of toppings are offered and it’s a DIY kind of night. If you want in on the fun, just find a crêpes recipe online (easy peasy) and let us give you some toppings ideas. To sum up: be creative, you can basically make a crêpe out of anything you would include in a sandwich, mix and match to your heart’s desire. 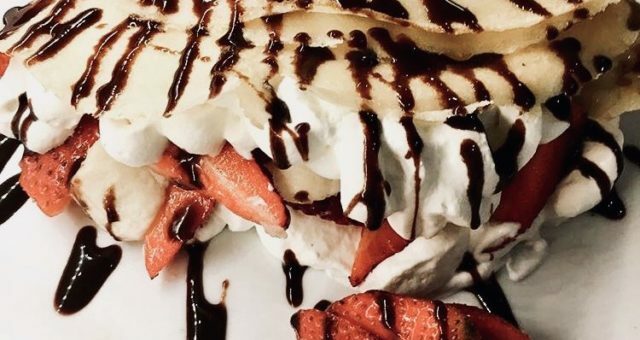 Add fruit and or chantilly (whipped cream) to your Nutella crêpe. Strawberries and Bananas are great. Add butter or lemon to any classic sugar crêpe for a nice twist. That’s about it, we hope you are reading this article close to your next meal because you must be hungry by now. Let us know if you do a crêpe party at home! And if you need some inspiration come to one of our cafés to get your Atelier Monnier crêpe.